For every action, there is an equal and opposite reaction. As popular as the indie folk and orchestral pop scene has become, there’s been a rise in straightforward, high-energy rock and roll. Luckily for us, we’re huge fans of both genres. We thoroughly enjoyed slowly swaying to Lost in the Trees last night, and tonight we’re excited to get crazy with one of our local favorites, My Goodness. My Goodness offers a blend of bluesy funk rock (think Black Keys) in a raw, lo-fi way. The band’s irreverent approach to music and raucous style makes it hard not to reminisce to the days of the grunge movement here in the PacNW. They also have an awesome new video out, which we highlighted last week. 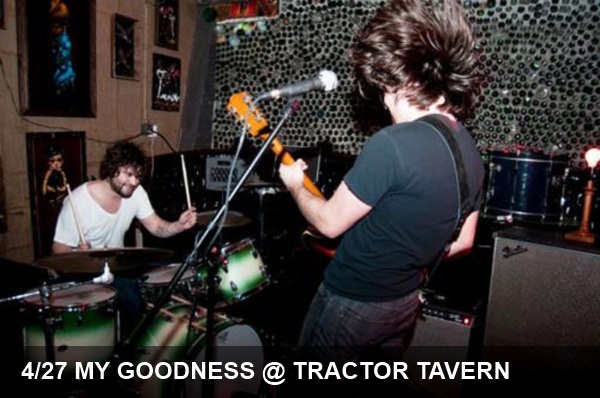 If you’re ready to let loose and rock out tonight, head over to the Tractor tonight. The full lineup is great, so arrive in time to see our friends Elba as well as Fox & the Law.